Average Retirement Debt: Do You Owe Too Much? Retirement News > Debt and Debt Management > Articles > Average Retirement Debt: 13 Tips to Prevent it From Taking a Big Bite Out of Your Future Finances! 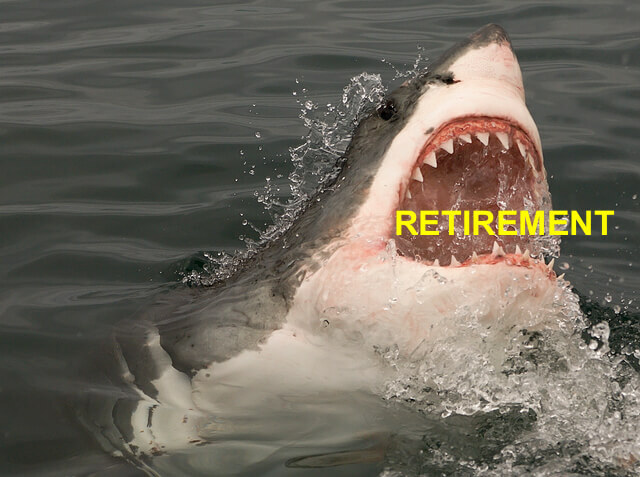 Average Retirement Debt: 13 Tips to Prevent it From Taking a Big Bite Out of Your Future Finances! One of the greatest threats to retirement today may not be saving too little, but owing too much. A 2016 survey by the Center for a Secure Retirement found that Boomers (Americans born between 1946 and 1964), are carrying a significant amount of debt into retirement. Will retirement debt take a big bite our of your budget? For many people, that debt is emerging as a serious threat to a successful retirement. Debt can be a constant source of stress and affect retirees’ ability to keep their homes, pay necessary living expenses, and even be accepted into independent- or assisted-living facilities. According to the survey, 8 in 10 middle-income Boomers currently have some debt. Three in 10 devote more than 40% of their monthly income to debt and a quarter have a mortgage with more than 20 years remaining on it. More than half say they intend to enter retirement debt free, but only one-quarter of retired Boomers actually are debt free. A 2016 survey from ValuePenguin found that the average credit card debt for all American Households is $5,700, but when you break down the numbers by age, the average for people age 65 and older jumps to $6,351. That means the average credit card debt load is more than double the maximum monthly Social Security payment of $2,687. When you compare credit card balances to the average monthly Social Security benefit of $1,342 per month, the situation is even bleaker. Houses, Education and Doctor Bills… Oh My! While credit cards are problematic, homes, education and medical bills are the primary sources of debt in retirement. Rising home prices and the longer-term mortgages that result often mean seniors must continue making monthly mortgage payments well into their retirement years. While we often equate student loan debt with Millennials, people over the age of 50 are the fastest-growing group with student loan debt, according to a report from the Government Accountability Office. Medical debt is another problem for retirees. While most retirees are covered by Medicare, Medicare coverage is limited. Not every procedure is covered, so the average retiree spends thousands of dollars on medical bills over the course of their retirement years. When retirees don’t have the cash available to pay medical bills, unexpected costs, and even daily living expenses, credit cards are often used to cover the shortfall. A 2013 study by AARP and the research and advocacy group Demos found that half of Americans age 50 and up carry balances for medical expenses on their credit cards, with prescriptions and dental expenses (which are not covered by Medicare) being the highest contributors. The AARP study also found that older Americans are more likely to take on credit card debt to help other family members. Nearly a quarter of people age 50 and up reported giving money to relatives or paying their debts as contributing factors to credit card balances. Should You Be Terrified of Debt? duunnn dunnn… duuuunnnn duun… duuunnnnnnnn dun dun dun dun dun dun dun… Too much debt really should give you that terrified feeling that there might be a great white shark lurking beneath you. Servicing debt payments on a fixed income can be a tremendous burden for retirees who cannot generate income from other sources to pay off that debt. It can be very hard to get ahead or even live comfortably while carrying large debt balances. A good percentage of your income could be diverted to paying interest and principal payments instead of shoring up retirement account balances or paying living expenses, such as food, housing, and medical bills. Student loan debt can be particularly threatening to retirement. Federal law allows the government to garnish the Social Security benefits of borrowers over the age of 50 who have defaulted on their student loans. In 2015 alone, the government took $171 million in Social Security payments from older Americans, according to a report from the Government Accountability Office. Carrying large amounts of debt also has a detrimental effect on credit scores. Credit checks are typically a part of the application process for acceptance into independent- and assisted-living facilities. Even if you are able to get through the application process, debt payments could make it difficult to afford to stay there, as adult care facilities cost tens of thousands of dollars per year, depending on the level of care needed. If you are at or near retirement, there are steps you can take to make sure that debt doesn’t destroy your retirement plans. Below are 13 tips for making sure debt doesn’t not ruin your retirement. If you need some motivation, use the NewRetirement retirement planner to see your future finances with and without debt. After entering some initial information, you will get a complete analysis of your situation. Next you can try out different scenarios and immediately see the impact of each change. See what happens if you accelerate your debt payments, work longer, reduce interest rates or try any of the other options. You can achieve retirement security. Stop: Stop adding to your debt balances. Remove credit cards from your wallet to reduce the temptation to use them on impulse purchases or things you can’t really afford. Prioritize: Prioritize paying off high-interest credit card debt. Don’t Worry: Worry a little less about your mortgage. While entering retirement mortgage-free is a dream for many people, it’s likely that the interest rate on your mortgage is a quarter of the rate charged by your credit card company, and credit card interest is not tax-deductible. Refinance: Because your mortgage interest rate is likely lower than what you are paying on other loans, you might consider cash out refinancing on your mortgage. You might increase the size of your mortgage, but if you use the cash to pay off credit cards or other expensive debt, you’ll come out ahead. Transfer: Consider taking advantage of low introductory credit card balance transfers. You may be able to transfer some higher-rate balances to a new card offering zero percent interest for a year. If you do, come up with a plan to pay off the balance during the interest-free period and make sure you don’t compound your problems by running up new charges on the old account. Work Longer: Consider working longer or getting a part-time job to help pay down debt. Every year that you continue to work is one more year that your retirement nest egg can grow – and more income that can be used to pay down debt balances. Pay: Pay your bills on time. Late payments will result in fees that will further increase your debt balances and hurt your credit score. Talk to your creditors about hardship or forbearance options if you think you may fall behind. Ask For a Payment Plan: Don’t charge medical expenses to credit cards unless you have a plan for paying it off. If you owe medical providers, talk to them about assistance plans. Avoid in-office financing offered by doctors, dentists and other medical providers as it can often be more expensive than a personal loan. Start an Emergency Fund: Work on building an emergency fund. While it may be difficult to save for a rainy day while paying down debt, having an emergency fund can help you avoid tapping credit cards when unexpected expenses come up, such as home or car repairs. Reduce Expenses: Work on reducing your living expenses. Budget conservatively to live within your means. That may mean getting rid of pricey cable television packages, dining out less, and even downsizing your home or moving to a less expensive area. Say No: Think twice about co-signing loans or going into debt to help adult children or grandchildren. While you may feel good about helping in the short-term, if you put yourself in a difficult financial situation, you could end up becoming a financial burden on your family members later. Get Help: If you are currently struggling to meet your obligations, contact a non-profit credit counseling service. A reputable credit counseling organization can help you develop a personalized plan to deal with your financial problems. Retain Savings: Don’t try to reduce debt by cashing out 401(k)s or other retirement accounts. If you are under age 59½, you’ll be charged an additional 10% penalty in addition to income taxes for any withdrawals from 401(k) and traditional IRA accounts. Plus, taking out large distributions from a qualified plan could push you into a higher tax bracket. For many Americans, carrying debt into retirement is unavoidable, but the earlier you develop a plan to deal with it, the easier it will be to tackle – and the better chance you’ll have of being able to afford the retirement you’ve always dreamed of. Use the Retirement Planner to see what happens if you improve your debt situation! Forbes Magazine calls this tool “a new approach to retirement planning” and it was named a best retirement calculator by the American Association of Individual Investor’s (AAII) and CanIRetireYet. What Happens to Your Debt When You Die? If You Run Out of Money, Are Heirs Responsible for the Bills?